Remember how Jacob tricked Isaac and Esau to secure the first-born birthright (Genesis 27, see notes)? Nevertheless...an oath is an oath. Remember how Laban tricked Jacob on his wedding night with the ol' bride switch-a-roo (Genesis 29, see notes)? Upset? Sure...but an oath is an oath. Here we go again. The local Gibeonites (of Canaan) pull a fast one over on Jacob's descendants...and live to tell about it. The acting was apparently superb (verses 12-13) as they convinced Joshua and the elders that they couldn't possibly be local residents. And once again, just like that thrashing Israel took in their first round at Ai, we see in verse 14 that Joshua failed to consult with God before making this covenant with the Gibeonites. 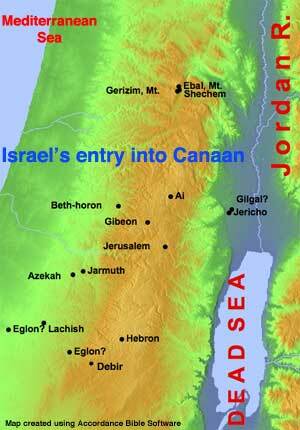 God had been very specific about treaties with the inhabitants of Canaan. DON'T DO IT! Recall God's instructions regarding them in Deuteronomy 7:1-6 (see notes) and Deuteronomy 20:16-18 (see notes) - ALL THE CANAANITES HAD TO GO! But Joshua did make a treaty (a binding vow) with these deceitful Gibeonites...ignorantly...but a treaty nonetheless. The key verse here is 14, "And the men took of their victuals, and asked not counsel at the mouth of the LORD." With their tattered-looking clothing and supplies added to their bold-faced lying, the Gibeonites had convinced Joshua and company to enter into a binding treaty of mutual protection with them. Where's a good attorney when you need one? In our litigious society, it would be unthinkable to honor the terms of a contract when blatant deceit and lying were involved in the formulation of the contract. Yet the Jews viewed contracts differently. It goes back to the Ten Commandments of God given to the Jews in Exodus 20 (see notes) and Deuteronomy 5 (see notes). This includes the frivolous use of God's name. Note Leviticus 19:12 (see notes), "And ye shall not swear by my name falsely, neither shalt thou profane the name of thy God: I am the LORD." The modern-day practice of the usage of "God" in profanity is just a subset of this commandment. The primary intent of the third commandment and confirmed by Leviticus 19:12 is that the Jews were forbidden from invoking God's name frivolously. If you used God's name, you had better mean it! So, understanding the gravity of invoking God's name into a proposition, let's look closely at the wording of verse 18, "And the children of Israel smote them not, because the princes of the congregation had sworn unto them by the LORD God of Israel. And all the congregation murmured against the princes." To renege on a guarantee for safety after swearing as they had done would have been a violation of the third commandment. So, it is established that these Gibeonites will be protected under God's covenant with Israel just like a naturally-born Hebrew. As a matter of fact, the Gibeonites call in a covenant marker in chapter 10 (see below), and Joshua is instructed by God to protect them. If you made an oath under false assumptions, everyone still regarded the oath to be binding. So, how long must they honor this treaty anyway? Well...an oath is an oath; unless otherwise stated, it's forever. Over 400 years later we find in II Samuel 21:1-14 (see notes) that God punished Israel with a famine because Saul had previously violated this oath made to the Gibeonites before his death. For more information on the Law of Moses concerning vows, click here to read the summary on Leviticus 27. Imagine the surprise of Joshua and the tribal leaders of Israel when they discovered that they have been duped (verses 17-19). The Hebrews were upset that their own leadership had entered into this treaty, but everyone honored it. However, Joshua decreed that day that, even though they would not be killed, the Gibeonites would serve as slaves of Israel (verse 27). Incidentally, we see in verse 7 here and in Joshua 11:19 that the folks of Gibeon were Hivites. Five kings (verse 3) decide it's time to put a stop to Israel's migration. They decide to go up against the people in Gibeon - not the Israelites, the Gibeonites (see above). These Gibeonites get word and make a plea to Joshua for help. Are you thinking what I'm thinking? Maybe Joshua should have let those five kings destroy the Gibeonites before engaging them in battle; that should have solved the dilemma of that whole vow thing back in chapter 9 (see above). However, Joshua does consult God this time; he's instructed to fight, and the result is a major victory! As a matter of fact, the battle victory is guaranteed by God before it begins in verse 8, "And the LORD said unto Joshua, Fear them not: for I have delivered them into thine hand; there shall not a man of them stand before thee." And then Israel gets some additional divine assistance in verse 11 with hailstones falling from the sky upon the enemy, "...they were more which died with hailstones than they whom the children of Israel slew with the sword." Furthermore, Joshua gets a little bonus here - extra daylight to finish up the job - a whole day's worth (verse 13). Talk about daylight saving time! By the way, we are told that the Book of Jasher referenced here was probably a kind of national sacred song-book, a collection of songs in praise of the heroes of Israel. I'm certain it had to have made a huge impression on Israel when Joshua says in verse 12, "Sun, stand thou still upon Gibeon." Now consider this: Based upon the oath Joshua had made with the Gibeonites in chapter 9 (see above), Joshua had no choice but to protect them. They were under the protection of God's covenant. What do you do when you have just witnessed the God of the Hebrews actually lengthening a day so his people could thoroughly trounce your people? Answer: Hide in a cave? Maybe that wasn't such a good idea after all, but that's what these five Canaanite kings do. Joshua simply has the cave sealed up until the battle is won; he uses these cowardly kings for a God-is-great object lesson in verses 24-25. Then they are hanged in public and placed back into the cave. That's what they get for leaving their troops to fight while they hide. As a symbol of disgrace, hanging a dead body on a tree was to make a point - POINT MADE! As a matter of fact, that's why the cross (hang on a tree) was necessary for the death of Jesus rather than stoning. The Jews had tried to stone Jesus to death on numerous occasions leading up to the crucifixion, but they failed each time. Jesus had to go to the cross. No other form of death would do. He prophesied that he would go to the cross in John 3:14 (see notes) and again in John 12:33 (see notes). Paul makes this point regarding hanging on a tree in Galatians 3:13 (see notes) when he says, "Christ hath redeemed us from the curse of the law, being made a curse for us: for it is written, Cursed is every one that hangeth on a tree." Just as these five kings were cursed on a tree, so was Jesus at his crucifixion on the cross. Then Joshua leads these quick in-an-out raids against numerous cities in the southern portion of Canaan - defeating each city. Verse 42 says it all, "And all these kings and their land did Joshua take at one time, because the Lord God of Israel fought for Israel." One big campaign through South Canaan gets the job done. Again, notice that God directed this campaign. Joshua, take note: When God leads, you do well; when you lead by yourself...well...you know. Ol' King Jabin organizes a coalition of kings from the northern part of Canaan to come down after Israel. Verse 4 has that phrase ("as the sand that is upon the sea shore in multitude") that indicates there were so many of them (the enemy), they could not even be counted. God knew how many there were and how to defeat them - cripple their horses and burn their chariots ("hough" means "hamstring"). It's kind of like blowing the tread off their tanks like they did back in WWII. Hey! You're not in Gibeon anymore! That's what we see in verse 20. Rahab and the Gibeonites demonstrated that God spared those who called upon the God of Israel, but destroyed those who did not. The "hardened" concept we saw back in Exodus regarding Pharaoh is at work here in this verse, "For it was of the LORD to harden their hearts, that they should come against Israel in battle, that he might destroy them utterly, and that they might have no favour, but that he might destroy them, as the LORD commanded Moses." These kings chose war, not peace. See notes on Deuteronomy 7:1-6. We see in verses 22-23 that only that area in southwest Israel known today as the Gaza strip remains to be taken. They finish the job in Judges 1:18 (see notes) where it says, "Also Judah took Gaza with the coast thereof, and Askelon with the coast thereof, and Ekron with the coast thereof." And...interestingly enough, Joshua was the one being attacked rather than the aggressor. The enemy came from all over Canaan to attack Israel, only to fall in defeat.